Have you been on the sidelines, flipping through the Highland catalog and reading woodturning books and magazines? Have you been hesitant to commit to a new hobby? Well, that’s what “Get to Woodworking” week is all about — taking that first step. Unfortunately, for some, learning a new skill can be one of over analysis and self-doubt. It can be intimidating to buy your first lathe, tools and accessories. Everyone wants to make a well-informed decision when it comes to expensive tool purchases. This can be challenging when considering a new craft, especially if one has never before used a lathe. You are fortunate to be exploring this craft in an era of widely available information, courses and a competitive manufacturing industry. This confluence of factors means you can make a good decision, and acquire tools that will last many years. Take advantage of all the available information online or in print to gain an academic understanding of the craft. However, there is no substitute for applying a tool to spinning wood. You can gain real-world experience without committing to acquiring a full setup. The simple solution is to take a class or join a woodturning club. 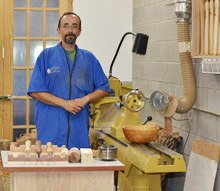 The American Association of Woodturners maintains a database of instructors and clubs. They can help you locate your nearest club or instructor. I cannot stress enough the importance of taking a beginning turning class. A good instructor will guide you through safe turning procedures, tool selection and various techniques. This gives you an easy way to experience turning under the guidance of a skilled turner. You can quickly recoup the cost for the class by learning what tools NOT to buy, as much as what to buy. During your first class you will have many “aha” moments. This is when the theory of tools and techniques starts to leap off the page and screen and actually make sense to you. Through this process, you will quickly start to draw conclusions about what types of turning and products you prefer. The difficult aspect for many is the commitment to taking a class or joining a club. Classes are a no-obligation opportunity to give it a spin. Most clubs welcome visitors and allow them to attend several meetings free of charge. Clubs are typically an enthusiastic group of turners from all skill levels who are more than happy to share their knowledge and experiences. Also, joining a club is a good way to make new friends who share your new interest. The message I want to leave with you is to take that first step and give woodturning a try. The craft has brought a new excitement and rewards to many turners. I hope you will schedule yourself for a turning class soon.